Get EXCITED! One of the best romance movies of the year is now out on DVD and Blu-ray! Safe Haven was released to Blu-ray, DVD and Digital Download on Tuesday, May 7 and it is a perfect movie to watch on a romantic night in with your significant other or for a girl's night! Josh Duhamel and Julianne Hough star in this spellbinding romantic drama based on the novel by best-selling author Nicholas Sparks (The Notebook). When a mysterious, beautiful woman named Katie (Hough), moves to Southport, North Carolina, she sparks the interest of the locals, especially Alex (Duhamel), a handsome widower. Although she is attracted to Alex, Katie is reluctant to trust him – that is, until a new friend (Cobie Smulders) convinces her to give Alex a chance. But before long, a dark secret from Katie’s past threatens her happiness in this thrilling romance directed by Lasse Hallström (Dear John). 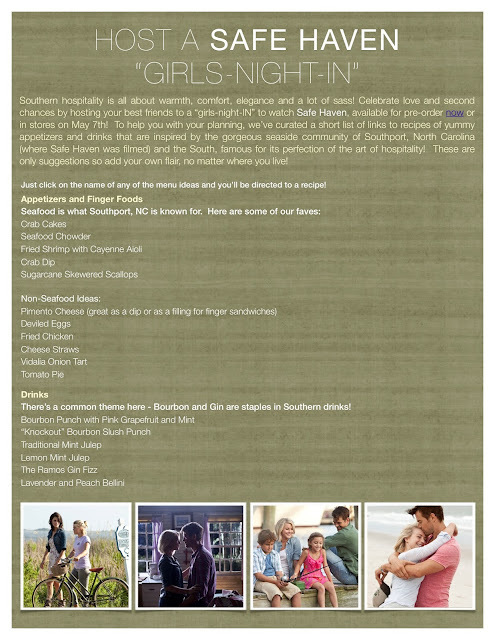 If you are watching Safe Haven at your next girl's night in, check out this fun Girls' Night In viewing party guide. So grab your besties and some tissues and watch the romance from Nicholas Sparks starring Julianne Hough and Josh Duhamel! Below is your one-stop shop viewing guide for appetizers, drinks and more! And make sure to click on the document below, download the document and have access to all the recipes simply by clicking on the menu ideas!